As the Haddonfield Public Library closes its chapter on its annex at 123 Kings Highway, it turns the page to start its next journey back at 60 N. Haddon Ave. 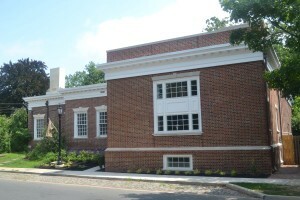 The Haddonfield Public Library began its transition back into its old home last week. The Sun got an inside peek of what has been done, what the public can expect to see when it opens and what still needs to be done. “I hope they’ll look around, take in the changes, but still see that it looks familiar and inviting at the same time,” Library Director Eric Zino said. 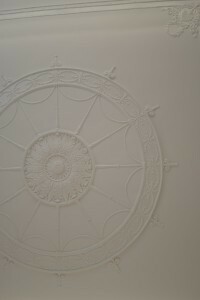 beautifully in the sunlight, and the plaster moldings above the fireplace and on the ceilings are completely restored. The columns too were kept intact, however they now are conveniently housing data ports, outlets and wiring. According to Zino, keeping the historical parts of the library intact was important, however it wasn’t the main goal for the renovations. “This project is about bringing us up to the 21st century, making us ADA compliant and improving a lot of the infrastructure, like the HVAC,” Zino said. The biggest upgrade was to get the library compliant with the American with Disabilities Act. 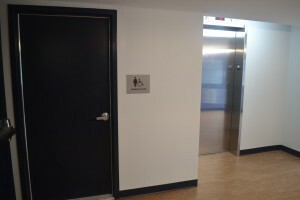 This was accommodated for by the addition on the right side of the library, housing elevators, fire stairs, bathrooms and extra closets. Zino said they are beautifying the area with exhibitions and a mural. 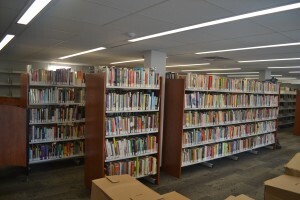 The ADA compliance also influenced the more open layout of the stacks at the library. This brings a lot of light into the library that wasn’t there before, giving it a warm, welcoming glow. “I’m excited for a new bright space that accommodates everybody who wants to use it. It was not very easy for everyone to use it before,” Amy Tan of the library staff said. Some volunteers at the library expressed concern with the library having to cut back on some books due to less space. However, they knew it was to better accommodate everyone. “(The renovated library) is very nice. 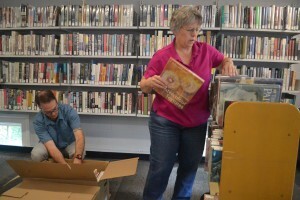 There is less space for books, but there is a valid reason for that, to make it more accessible for more people,” volunteer and Friends of the Library member John Wolf said. Zino said it is normal for libraries to “weed” out books regularly to accommodate new ones. The library is constantly getting new content and, with a finite amount of space, it can only fit so much. But Zino said that is the reason there are interlibrary loans — so if the HPL doesn’t have it, another library can. “I don’t really see (removing books) as a drawback … As part of our normal activities, we are removing things from the collection to accommodate the new things in the collection. The ADA aspects of the configuration of the shelving has influenced that loss, but this is a great thing as it’s more useful to more people,” Zino said. According to Zino, there are many things to love about the new library. He mentioned the circulation desks have better placement and better heights, much of the shelving and furniture is mobile for better flexibility, and the color palette and lighting is more pleasing to the eye. He is really excited for the technology improvements. Where the stairs from the teen room and the old technical services room used to be, there is a classroom Zino hopes will be used for classes and community meetings. Inside that room will be an interactive projector people can use with the flick of their hand. The library also added a 3D printer, a variety of computers on different platforms, as well as digital programing. Zino hopes to add more to what they’re already planning. “We’re open to what else the community wants us to do,” Zino said. There are still some things the library would like to do, such as getting new windows and fixing the exterior of the library, but for now the focus is getting the library back up and running. The library still needs to install some of the technology, add shelving, have the murals finished and, of course, set up books. Haddonfield Public Library is offering limited services while the library is closed. Its online and electronic resources will still be available and drop boxes are still open for returning items at the annex location. Children’s programing will also still take place throughout the summer at Borough Hall, 242 Kings Highway East. Although there is no opening date as of yet, the hope is to have the library open the first week of August, Zino said. A grand opening will come later in September, as the borough would like to have residents around for the event. Zino said the library is planning to celebrate its 100th anniversary next year, as construction began on the library in 1917, and will continue that celebration through 2019 as it was officially opened in 1919. 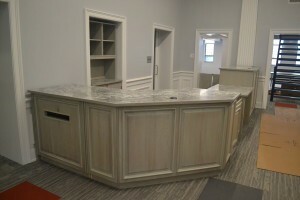 Follow what will be happening with the library by visiting www.haddonfieldlibrary.org.